OSWEGO – For years, awe-inducing Grucci fireworks display on Saturday night has been an iconic Harborfest tradition. From left are: Harborfest president Chena Tucker, Entergy senior communications specialist Tammy Holden and Harborfest Executive Director Peter Myles at the time of sponsorship confirmation in January. As the countdown to Harborfest begins, the festival would like to acknowledge the effort and support of Entergy Nuclear for its longtime sponsorship of the attraction that has become almost synonymous with Harborfest itself. The Entergy-sponsored Grucci Fireworks Spectacular starts at 9:30 p.m. on July 30 and its world-class display and synchronized soundtrack are sure to have people talking until next year’s show, the 30th Harborfest. The best viewing areas for the Entergy Fireworks Spectacular by Grucci ranges from Fort Ontario on the east side of Oswego to the inner harbor and Breitbeck Park along the west side. Entergy also sponsors the Entergy Nuclear Activity Tent in Breitbeck Park, featuring face painting, temporary tattoos, arts and crafts and other free, fun, and hands-on activities for families visiting the festival. Harborfest is proud to have the support of businesses who give back to the community in which many employees live and work, and are honored to be part of an annual tradition that draws crowds every single year. Harborfest is one of the few admission-free music festivals in the country. It was founded with the mission of creating nationally recognized festivals and events that attract and engage a broad and diverse audience, celebrate and build community, and advance economic development in Oswego. It would not be possible to continue the event without the massive continued support received from the city of Oswego, businesses, organizations, government entities, and individuals and family members. 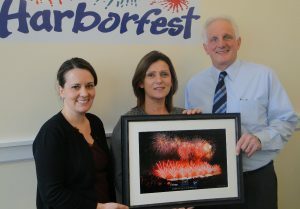 To learn more about the Entergy-sponsored Grucci Fireworks, about sponsorship, or about Harborfest, visit www.oswegoharborfest.com or call 343-6858.